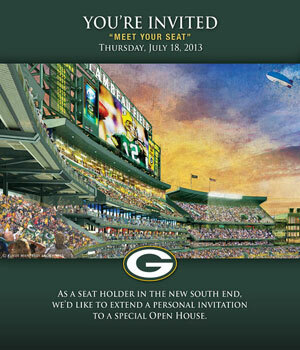 Seat holders in the new south end zone of Lambeau Field will get an opportunity to “meet their seat” at a special open house on Thursday, July 18. The event will run from 2-8 p.m. and will be self-guided, allowing ticket holders the opportunity to explore the newest stadium expansion at their own pace. Invitations have been mailed out to seat holders in the new south end zone, who will receive a map of the areas open for viewing upon their arrival. Seat holders will have an opportunity to get a photo of themselves with a view of the stadium in the background, and some concession stands in the south end zone will be open, with special pricing for the event. The video boards will be showing the 2012 Packers highlight film on the hour, every hour, beginning at 3 p.m.